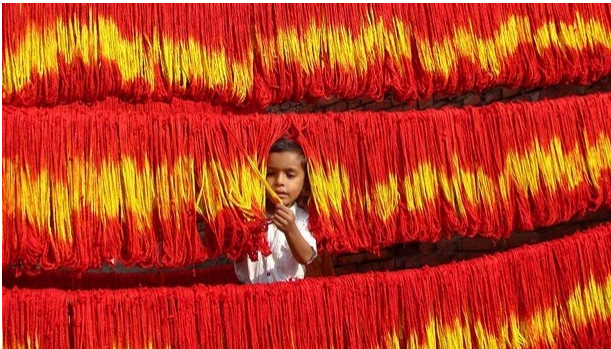 A Red thread known as Mauli or Kalava or Charadu is tied on wrist by Hindus before the beginning of a religious ceremony. The thread is tied on the right hand by males and on the left hand by females. The thread is tied to invoke the blessings of the Hindu deities especially of the particular deity to whom the puja is dedicated. There is also a popular belief that the sanctified red thread with blessing of the deity protects a person from diseases, enemies and other dangers. It is customary for Hindus to tie a red thread – commonly called a mauli or kalava – on the wrist at the beginning of a religious ceremony. The thread is tied on the right wrist of men and the left wrist of women. The literal meaning of mauli is ‘above all’. Here the reference is to the head that stands high. 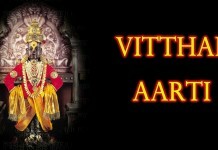 With the moon perched on top of Shiva’s head he is referred to as Chandramauli. 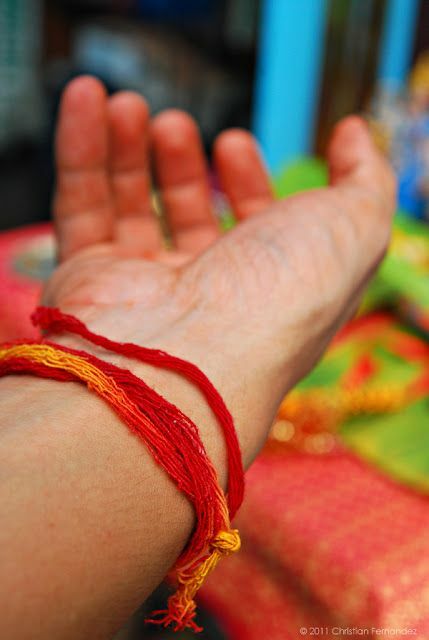 A person often puts on the red thread on one’s wrist when doing a ceremony, ritual or puja, such as worship to the Ganga River, a deity, or for certain blessings. The thread helps preserve or imbibe those blessings when it is tied around one’s wrist during the ceremony. The practice of tying the thread dates back to the time when Vamana Bhagwan tied this holy thread on the wrist of the progressive King Bali to grant him immortality. The thread can also be called a raksha or rakhi, and is put on the brother by the sister to show the sister’s familial love. The knots in the thread are said to hold the love of the sister when she tied the knot. Thus, the brother wears the rakhi as a sign of his sister’s love and wishes for protection. In other arrangements, the knots tied in the rakhi as the red strings are given to guests or tied around their wrists before a special ceremony or reception is also considered to hold the goodwill of those who offer it. – on the wrist at the beginning of a religious ceremony. The thread is tied on the right wrist of men and the left wrist of women. The literal meaning of mauli is ‘above all’. Here the reference is to the head that stands high. 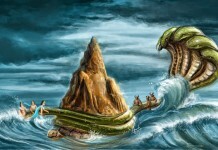 With the moon perched on top of Shiva’s head he is referred to as Chandramauli. The thread can also be called a raksha or rakhi, and is put on the brother by the sister to show the sister’s familial love. The knots in the thread are said to hold the love of the sister when she tied the knot. Thus, the brother wears the rakhi as a sign of his sister’s love and wishes for protection. In other arrangements, the knots tied in the rakhi as the red strings are given to guests or tied around their wrists before a special ceremony or reception is also considered to hold the goodwill of those who offer it.